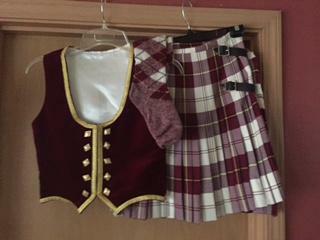 dance.net - Child's Burgandy Highland Dancing Costume (10245279) - Read article: Ballet, Jazz, Modern, Hip Hop, Tap, Irish, Disco, Twirling, Cheer: Photos, Chat, Games, Jobs, Events! Can you send a measurement of the hose too? How long are they from heel to the top of the cuff? How long are they from heal to toe (unstretched)? Also, is there a hem at the bottom of the kilt? If so, how big is it? What age was your daughter when she wore this? Is this still available? What age was dance who wore this.